Since the time Fleming discovered penicillin, antimicrobial agents have become essential drugs for maintaining human and animal health. Antibiotics, apart from their use to treat infections, are also used in food animals, agriculture and aquaculture prophylactically. Antimicrobial resistance is one of the world’s most pressing health problem with substantially increased morbidity. The emergence and spread of resistant bacteria is recognized as a growing threat at both national and global levels. Pathogens harbouring extended spectrum beta lactamase like carbapenem resistant gram negative bacteria, methicillin-resistant Staphylococcus aureus (MRSA), Vancomycin resistant Enterococci (VRE), Streptococcus pneumoniae are major emerging threats to public health. The Centre for Disease Control (CDC), U.S.A estimates that more than half of mortality due to bacterial infection are due to the involvement of resistant bacteria. Hence, WHO has recommended for a coordinated action plan to minimize the emergence and spread of resistant phenotypes. Extensive uses of antimicrobial agents for non-medical purposes such as agriculture, animal husbandry, aquaculture, industry has raised concerns in recent years and are highly suspected for their role of development of AMR in health care settings. In the current situation, development of resistance is much rapid than new drug development by pharmaceutical companies. Some new beta-lactamase inhibitors in combination with antimicrobial agent have been developed for the treatment of gram negative infections. However, the emergence of new drug resistant phenotypes are more. In general, the antibiotic crisis has been attributed to not only the extensive and inappropriate usage of antibiotics but also to a drastic decline in the development of new antibiotics. A thorough knowledge in emergence and spread of drug resistant isolates will provide potential strategies to curtail the emergence of multi drug resistance. Owing to its complexity in resistance development and treatment failures, recently much investigation was developed on the emergence and spread of the resistant genes, however research in combating resistant bacteria is in its infancy. This conference has been made to present the latest research to navigate the possibilities to address this question. This scientific gathering will provide some potential strategies to curtail the emergence of antimicrobial resistance. 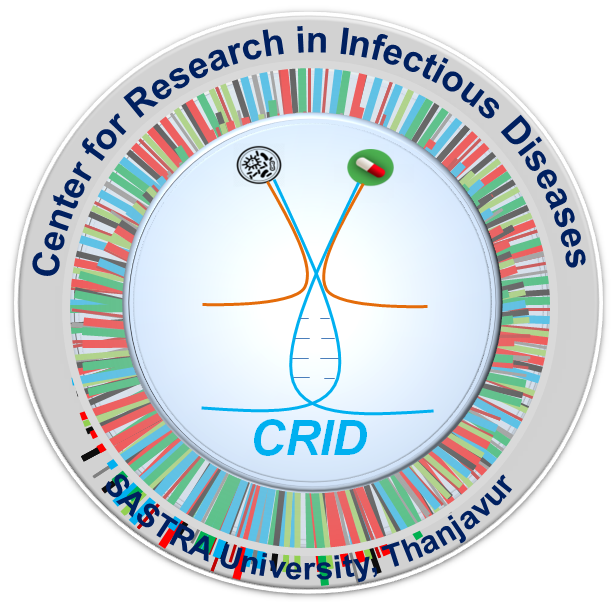 The Centre for Research on Infectious Diseases (CRID) is a centre under School of Chemical and Biotechnology (SCBT) with a vision to develop novel approaches for combating emerging and re-emerging drug resistant infectious diseases. CRID is comprised of faculty with diverse expertise carrying out inter disciplinary research on Host-Pathogen interaction, Molecular Pathogenesis, Drug development and Development of Rapid Diagnostic tools. Evolution of E.coli in deep stationary phase via regulatory mutations.